Selective neck dissection levels I-III. Selective neck dissection levels II-IV. Selective neck dissection for thyroid cancer: selective neck dissection VI, or anterior neck dissection. Selective neck dissection for posterior scalp and upper posterolateral neck cutaneous malignancies: selective neck dissection II-V, postauricular, suboccipital, or posterolateral neck dissection. The 6 levels of the neck with sublevels. Neck dissection with conservation of nonlymphatic structures was shown by Bocca, Gavilan, and others to yield equivalent oncologic outcomes, with improved functional results. [2, 3] Experimental studies of lymphatic drainage, coupled with clinical studies of the specific location of nodal metastasis within neck dissection specimens, provided the rationale for more targeted surgery. [4, 5, 6] The data allowed for reliable prediction of the lymph node groups most likely to be involved with metastatic disease from specific primary tumor location and established which lymph node groups carry negligible risk of involvement and may be safely preserved. As a result, a great variety of surgical procedures have been described for use in various clinical situations. In his 1964 study of lymphatic drainage of this area, Fisch, using the technique of lymphography, was able to improve upon the anatomic classification proposed by Rouviere. Fisch classified these lymph nodes into the following 5 categories: junctional, jugular, spinal, supraclavicular, and retroauricular. However, the nomenclature in popular use today comes from the Memorial Sloan Kettering Cancer Center. This classification was used to describe the patterns of metastatic dissemination observed in more than 1000 patients who were treated at the center with radical neck dissection. 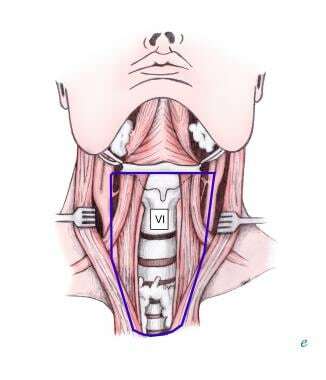 Lymph nodes in the neck are grouped into levels I-V, corresponding with the submandibular and submental nodes (level I); upper, middle, and lower jugular nodes (levels II, III, IV); and posterior triangle nodes (level V). Refer to the following image. Level I may be divided into level Ia, which refers to the nodes in the submental triangle (bound by the anterior bellies of the digastric muscles and the hyoid bone), and Ib, which refers to the submandibular triangle nodes (see image below). The nodes of level Ia are at greatest risk of harboring metastasis from cancers that arise from the floor of mouth, anterior tongue, anterior mandibular alveolar ridge, and lower lip, while the nodes of level Ib often receive metastasis from cancers of the oral cavity, anterior nasal cavity, soft tissue structures of the midface, and submandibular gland. Closely related, although not strictly a part of the level I group of nodes, are the perifacial nodes, related to the facial vessels above the mandibular margin, and the buccinator nodes, which may become involved with metastasis from tumors in the buccal mucosa, nose, and soft tissues of the cheek and lips. The spinal accessory nerve, which travels obliquely across this area, is used as a landmark to subdivide this group into IIb, the portion above and behind the nerve, and IIa, the part that lies anteroinferiorly and closer to the internal jugular vein as depicted below. The nodes in level II are at greatest risk of harboring metastasis from cancers that arise from the oral cavity, nasal cavity, nasopharynx, oropharynx, hypopharynx, larynx, and parotid gland. Level III nodes are located between the hyoid superiorly and a horizontal plane defined by the inferior border of the cricoid cartilage. The sternohyoid muscle marks the anterior limit of level III, and the posterior border of the sternocleidomastoid muscle is the posterior border. Level III most commonly receives metastasis from cancers that originate in the oral cavity, nasopharynx, oropharynx, hypopharynx, and larynx. See the image shown below. This refers to the group of nodes related to the lower third of the jugular vein. 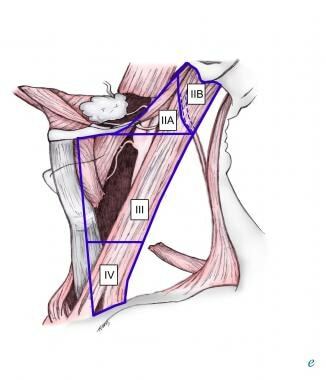 These nodes are located between the inferior border of the cricoid cartilage and the clavicle, and, like level III, the anterior boundary is the sternohyoid muscle, and the posterior border is the posterior border of the sternocleidomastoid muscle. The nodes of level IV commonly harbor metastasis from cancer that originates in the larynx, hypopharynx, thyroid,  and cervical esophagus as shown below. This refers to the lymph nodes located in the posterior triangle of the neck. These include the spinal accessory, transverse cervical, and supraclavicular group of nodes. Level V is bound anteriorly by the posterior border of the sternocleidomastoid muscle and posteriorly by the anterior border of the trapezius muscle. Level V extends from the apex of the convergence of the sternocleidomastoid and trapezius muscle superiorly to the clavicle inferiorly as shown below. This level is subdivided by a plane defined by the inferior border of the cricoid cartilage into level Va superiorly and level Vb inferiorly. 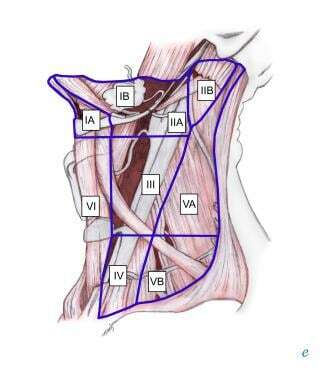 Level Va contains the nodes associated with the spinal accessory nerve, and level Vb contains the transverse cervical and supraclavicular nodes. The posterior triangle nodes are at greatest risk for harboring metastasis from cancers that arise in the nasopharynx, oropharynx, and skin of the posterior scalp and neck. This refers to lymph nodes of the anterior, or central, compartment of the neck. Defined by the carotid arteries laterally, the hyoid bone superiorly, and the suprasternal notch inferiorly, it is rich in lymphatics that drain the thyroid gland, subglottic larynx, cervical trachea, hypopharynx, and cervical esophagus. Lymph nodes in this compartment are located in the tracheoesophageal groove (paratracheal nodes), in front of the trachea (pretracheal nodes), around the thyroid gland (parathyroidal nodes), and on the cricothyroid membrane (precricoid or Delphian node). Lymph nodes in the central compartment are not routinely excised in radical neck dissection; most commonly, they are removed during surgery for thyroid, laryngeal, and hypopharyngeal cancer. See image shown below. Radical neck dissection is the standard basic procedure for cervical lymphadenectomy, and all other procedures represent one or more modifications to this procedure. When modification of the radical neck dissection involves preservation of one or more nonlymphatic structures, the procedure is termed a modified radical neck dissection (see the Medscape Reference article Modified Radical Neck Dissection). When the modification involves one or more lymph node groups that are routinely removed in the radical neck dissection, the procedure is termed a selective neck dissection. When the modification involves removal of additional lymph node groups or nonlymphatic structures relative to the radical neck dissection, the procedure is termed an extended radical neck dissection. Originally described by Crile in 1906, this procedure is an en bloc clearance of all fibrofatty tissue from one side of the neck, including the lymph nodes from levels I-V and lymph nodes that surround the tail of the parotid gland, the spinal accessory nerve, the internal jugular vein, and the sternocleidomastoid muscle. Radical neck dissection does not include the removal of the postauricular, suboccipital, perifacial, buccinator, retropharyngeal, or central compartment nodes. Previously used for neck disease of any stage, from microscopic to bulky nodal disease, this procedure is now limited to patients with advanced neck disease, recurrent disease after chemoradiation, or gross extracapsular spread to the spinal accessory nerve, sternomastoid muscle, and the internal jugular vein. Modified neck dissection is indicated for clinically palpable metastatic neck disease. Conversion to the radical neck dissection becomes necessary upon gross involvement of the nerve, vein, and muscle, although the involvement of all 3 is unusual, except in very advanced (N3) disease. Comprehensive neck dissection is a term that frequently appears in the literature. This term refers to any type of neck dissection that involves removal of lymph nodes from levels I-V and corresponds, therefore, to radical neck dissections and modified radical neck dissections, according to the Academy's classification. This term refers to a type of neck dissection in which one or more lymph node groups normally removed in a radical neck dissection are preserved. The 1991 classification schema classified selective neck dissections into the following categories: supraomohyoid neck dissection (levels I, II, III), lateral neck dissection (levels II, III, IV), anterior compartment neck dissection (VI), and posterolateral neck dissection (levels II, III, IV, V). Because of the increased use of selective neck dissection and the increased selectivity with which lymph node groups are removed, the Committee for Head and Neck Surgery and Oncology revised the classification of selective neck dissections in 2002. Because the 1991 classification did not provide an accurate description of procedures in which the surgeon preserves certain sublevels, the 2002 classification excludes the above listed "named" selective neck dissections. In the 2002 classification, selective neck dissections are described with respect to the lymph node levels removed. For example, a supraomohyoid neck dissection is described as a selective neck dissection (I-III). Selective removal of the level I, II, and III lymph nodes is the surgical procedure of choice for management of N0 and N1 disease that originates from cancers of the oral cavity as shown below; however, because of the lymphatic drainage of the oral tongue, some authorities advocate selective neck dissection (I-IV) for cancers that originate from this subsite. The operation includes the resection of soft tissue in the submental triangle, along with the submandibular triangle contents, including the submandibular gland and the fibrofatty tissue along the internal jugular vein from the skull base to the omohyoid muscle (or clavicle). The dissected contents include the fascia that covers the medial aspect of the sternomastoid muscle; the muscle itself is laterally retracted and preserved. These neck contents are peeled off from the internal jugular vein and from around the accessory nerve, sparing these structures (see the image below). The spinal accessory nerve, sternomastoid muscle, and internal jugular vein are spared in this operation, while the lymph nodes are removed from the skull base superiorly to the clavicle inferiorly, and from the cutaneous branches of the cervical plexus at the posterior border of the sternocleidomastoid muscle posteriorly to the sternothyroid muscle anteriorly. If the jugular chain nodes above the spinal accessory nerve were preserved, the procedure would be named selective neck dissection (IIa, III, IV). This operation involves excision of the level VI lymph nodes (selective neck dissection [VI]). The procedure is indicated for the treatment of cancers of the thyroid gland (see image below), hypopharynx, cervical trachea, cervical esophagus, and subglottic larynx. The boundaries of the dissection are the hyoid bone superiorly, the suprasternal notch inferiorly, and the carotid sheaths on both sides. Hypoparathyroidism may be a disabling complication if care is not taken to identify and preserve the parathyroid glands, and injury to the parathyroid blood supply is a risk with this procedure. Excising and reimplanting the glands into the sternomastoid or pectoralis major muscle may be necessary. Alternatively, the dissection may be limited to one side if the lesion is not close to the midline, particularly if radiation therapy can be administered postoperatively. Selective neck dissection (II-V, postauricular, suboccipital) was initially described as a posterolateral neck dissection by Rochlin in 1962 and later modified and popularized by Geopfert et al for use in patients with cutaneous malignancies of the scalp and postauricular and suboccipital regions as depicted below. Unlike all other neck dissections, this operation is performed with the patient in the lateral decubitus position and consists of an en bloc removal of the lymph nodes in the suboccipital; postauricular; and upper, middle, and lower jugular nodes, along with posterior triangle nodes situated superior to the accessory nerve. See the image below. Although the original description included sacrifice of the accessory nerve, internal jugular vein, and a portion of the trapezius muscle, Diaz et al from the MD Anderson Cancer Center showed in 1996 that the preservation of these nonlymphatic structures does not increase the failure rate of this operation. Any variation of this operation involves naming the level of nodes removed. In cancers that arise in the preauricular, anterior scalp, or temporal region, the elective neck dissection of choice is selective neck dissection (II, III, Va, parotid, facial, external jugular nodes). In cases of advanced neck disease, certain lymphatic or nonlymphatic structures not routinely included in the aforementioned neck dissections may have to be removed. Extended neck dissection is the term used to describe these procedures. Retropharyngeal lymph nodes, the hypoglossal nerve, portions of the prevertebral musculature, or the carotid artery are some of the structures that may occasionally have to be excised to obtain negative margins. All additional lymphatic and nonlymphatic structures removed should be identified in parentheses. What is the anatomy of the neck relative to neck dissection? What is the anatomy of the level II group of lymph nodes in neck dissection? What is the anatomy of the level III group of lymph nodes in neck dissection? What is the anatomy of the level I group of lymph nodes in neck dissection? What is the anatomy of the level IV group of lymph nodes in neck dissection? 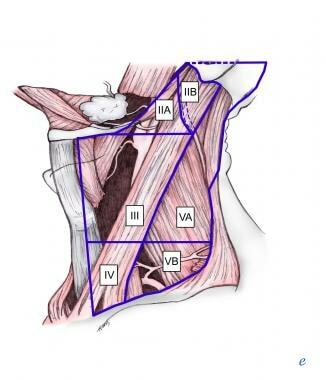 What is the anatomy of the level V group of lymph nodes in neck dissection? What is the anatomy of the level VI group of lymph nodes in neck dissection? What are principles of neck dissection classification? How is radical neck dissection defined? How is modified radical neck dissection defined? How is selective neck dissection defined? What are the United Kingdom (UK) National Multidisciplinary Guidelines for use of selective neck dissection in the management of neck metastases? What are the United Kingdom (UK) National Multidisciplinary Guidelines for use of selective neck dissection in the management of thyroid cancer? What are the United Kingdom (UK) National Multidisciplinary Guidelines for use of selective neck dissection in the management of lateral skull base cancer? What is the role of neck dissection in the treatment of oral cavity cancer? What is the role of neck dissection in the treatment of oropharyngeal, hypopharyngeal, and laryngeal cancer? What is the role of neck dissection in the treatment of cancer of the midline structures of the anterior lower neck? What is the role of neck dissection in the treatment of cutaneous malignancies? How is extended neck dissection defined, and what are prognostic factors in extended neck dissection for HPV-related oropharyngeal SCC? Hemmat S, Wang SJ, Ryan WR. How, when, and from whom neck dissection operative technique is learned: An international survey on neck dissection education among head and neck oncologic surgeons. Am J Otolaryngol. 2016 May 4. [Medline]. Bocca E, Pignataro O, Oldini C, et al. Functional neck dissection: an evaluation and review of 843 cases. Laryngoscope. 1984 Jul. 94(7):942-5. [Medline]. Gavilan C, Gavilan J. Five-year results of functional neck dissection for cancer of the larynx. Arch Otolaryngol Head Neck Surg. 1989 Oct. 115(10):1193-6. [Medline]. Fisch UP, Sigel ME. Cervical lymphatic system as visualized by lymphography. Ann Otol Rhinol Laryngol. 1964 Dec. 73:870-82. [Medline]. Ferlito A, Rinaldo A, Robbins KT, et al. Neck dissection: past, present and future?. J Laryngol Otol. 2006 Feb. 120(2):87-92. [Medline]. Robbins KT. Classification of neck dissection: current concepts and future considerations. Otolaryngol Clin North Am. 1998 Aug. 31(4):639-55. [Medline]. Robbins KT, Shaha AR, Medina JE, et al. Consensus statement on the classification and terminology of neck dissection. Arch Otolaryngol Head Neck Surg. 2008 May. 134(5):536-8. [Medline]. Akutsu Y, Matsubara H. Lymph node dissection for esophageal cancer. Gen Thorac Cardiovasc Surg. 2013 Mar 26. [Medline]. McAlister ED, Goldstein DP, Rotstein LE. Redefining classification of central neck dissection in differentiated thyroid cancer. Head Neck. 2014 Feb. 36(2):286-90. [Medline]. Dua A, Desai SS. Utility of internal jugular vein reconstruction in modified radical neck dissection. Vascular. 2013 Mar 19. [Medline]. Barzan L, Talamini R, Franchin G, et al. Effectiveness of selective neck dissection in head and neck cancer: the experience of two Italian centers. Laryngoscope. 2015 Apr 17. [Medline]. [Guideline] Paleri V, Urbano TG, Mehanna H, et al. Management of neck metastases in head and neck cancer: United Kingdom National Multidisciplinary Guidelines. J Laryngol Otol. 2016 May. 130 (S2):S161-9. [Medline]. [Full Text]. [Guideline] Mehanna H, Kong A, Ahmed SK. Recurrent head and neck cancer: United Kingdom National Multidisciplinary Guidelines. J Laryngol Otol. 2016 May. 130 (S2):S181-90. [Medline]. [Full Text]. [Guideline] Mitchell AL, Gandhi A, Scott-Coombes D, Perros P. Management of thyroid cancer: United Kingdom National Multidisciplinary Guidelines. J Laryngol Otol. 2016 May. 130 (S2):S150-60. [Medline]. [Full Text]. [Guideline] Homer JJ, Lesser T, Moffat D, Slevin N, Price R, Blackburn T. Management of lateral skull base cancer: United Kingdom National Multidisciplinary Guidelines. J Laryngol Otol. 2016 May. 130 (S2):S119-S124. [Medline]. [Full Text]. Amit M, Hilly O, Leider-Trejo L, Popovtzer A, Gutfeld O, Shvero J, et al. The role of elective neck dissection in patients undergoing salvage laryngectomy. Head Neck. 2012 Sep 28. [Medline]. Song CM, Ji YB, Sung ES, Kim DS, Koo HR, Tae K. Comparison of Robotic versus Conventional Selective Neck Dissection and Total Thyroidectomy for Papillary Thyroid Carcinoma. Otolaryngol Head Neck Surg. 2016 Jun. 154 (6):1005-13. [Medline]. Diaz EM Jr, Austin JR, Burke LI, et al. The posterolateral neck dissection. Technique and results. Arch Otolaryngol Head Neck Surg. 1996 May. 122(5):477-80. [Medline]. Zenga J, Pipkorn P, Graboyes EM, et al. Oncologic outcomes of extended neck dissections in human papillomavirus-related oropharyngeal squamous cell carcinoma. Head Neck. 2018 May. 40 (5):955-62. [Medline].